The Model 1555/1558/1559 Liquid Filled Gauge has a SST case, brass socket, and a phosphor bronze bourdon tube for applications requiring the protection of liquid filling. The 1555/1558/1559 gauges come in a low mount, center back or front flange configurations. They are available in gauge sizes for every need: 1½”, 2”, 2½”, and 4”. Liquid fill fluid dampens the gauge pointer movement and improves readability, making these instruments ideal for high shock and vibration applications. Liquid filling extends the life of your pressure gauge. 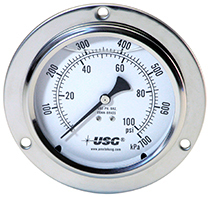 Model 1555/1558/1559 liquid filled gauges have a crimped ring and dual scale psi/bar or kPa/psi dial as standard. The pressure gauge is suitable for environments with high vibration, pulsation, pressure spikes and condensation build up. Liquid filling protects the internals of the pressure gauge, and dampens the pointer to improve readability. Liquid filling also eliminates condensation build up due to temperature fluctuations on the inside window. The case is material is 304 SST with a crimped on window and a liquid fill plug at the top of the case for easy field filling if needed. The 1½”, 2”, and 2½” versions meets ASME B40.100 Grade B accuracy (±3-2-3%) and the 4” unit meets Grade B+ accuracy (±1.6%). Pressure ranges are from Vacuum to 10 000 psi. Gauge size: 1½", 2", 2½", or 4"
Size: 1½", 2", 2½", or 4"